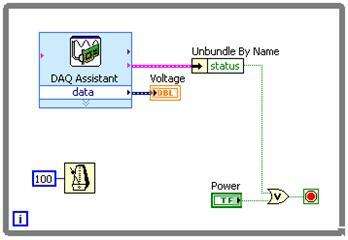 a) To learn how to use LabVIEW for analog input through a DAQ card. b) To learn about Analog to Digital conversion and how to acquire a signal and display it in LabVIEW. c) To study the effect of the sampling frequency in analog to digital conversion. In this experiment, you will write a LabVIEW VI to acquire an analog signal from the analog input pins of the NI ELVIS, display it in LabVIEW, and calculate its RMS and average values. You will also show the relationship of amplitude to number of averages. This lab requires background in analog to digital conversion and the concepts of sampling and Nyquist sampling theorem. d) Manual de prezentare a mediului de programare grafic LabVIEW. For example, a signal with a bandwidth of 1000Hz must be sampled at 2000 or more samples/second without any loss of information. Sampling at exactly twice the signal frequency is not enough in most practical situations. Figure1 illustrates this problem and it is a common practice to use a sampling rate as much as 10 times the signal bandwidth is used when doing an anolog to digital conversion. Figure 2. Adequately sampled signal and under sampled signal. The term quantization error (or quantization noise) is used to describe the fact that a digital value can correspond to a distinct span of analog signals. Any analog signal within the zone of one LSB will have the same digital value and therefore look identical to all others after the analog-to-digital process. It is this small degree of error in misrepresentation that is known as quantization error. In order to closely reconstruct the original analog signal, the analog to digital conversion process needs to minimize the quantization error as much as possible. To reduce the quantization error, more divisions (higher resolution) should be used to represent the analog value. As shown in the figure above, LabVIEW initiates a DAQ operation by calling NI-DAQ which contains the drivers for the board, i.e. signals the hardware to initiate the I/O operation. DAQ boards use on-board buffers and RAM buffers as an intermediate place to store the data they acquire. Also hardware can be used to initiate the I/O operation, which is called a triggering. A Buffer is an area of memory reserved as a temporary location for data. For fast data acquisition, the DAQ board stores the data into a buffer immediately after acquisition, so that it may be retrieved later for display or analysis. When the PC memory is used for the buffer, it is called a DMA (Direct Memory Access) operation. It is recommended to use the buffered I/O when you need sample more than 10 samples per second. Nonbuffered I/O can be used for slow signals and also reduces memory overhead for the PC. Triggering refers to any method by which you initiate, terminate, or synchronize a DAQ event. A trigger is usually a digital or analog signal whose condition is analyzed to determine the course of action. Software Triggering is the easiest and most intuitive way to do it—you control the trigger directly from software, such as using a Boolean front panel control to start/stop data acquisition. Hardware Triggering lets the circuitry in the board take care of the triggers, adding much more precision and control over the timing of your DAQ events. Hardware triggering can be further subdivided into external and internal triggering. An example of an internal trigger is to program the board to output a digit pulse when an analog-in channel reaches a certain voltage level. An example of an external trigger is to have the board wait for a digital pulse from an external instrument before initiating an acquisition. Many instruments provide a digital output (or “trigger output”) for this purpose. • DAQ events must be synchronized with an external device. All the functions related to the data acquisition are accessed through NI DAQmx palette located at Functions>> Measurements I/O. DAQ Assistant is a graphical interface for interactively creating, editing, and running NI-DAQmx virtual channels and tasks. An NI-DAQmx virtual channel consists of a physical channel on a DAQ device and the configuration information for this physical channel, such as input range and custom scaling. An NI-DAQmx task is a collection of virtual channels, timing and triggering information, and other properties regarding the acquisition or generation. 2. NI-DAQmx Create Virtual Channel. The NI-DAQmx Create Virtual Channel function creates a virtual channel and adds it to a task. It can also be used to create multiple virtual channels and add all of them to a task. When a task is not specified, the function creates a task. The NI-DAQmx Create Virtual Channel function has numerous instances. These instances correspond to the specific type of measurement or generation the virtual channel(s) perform. The NI-DAQmx Timing function configures the timing for hardware-timed data acquisition operations. This includes specifying whether the operation will be continuous or finite, selecting the number of samples to acquire or generate for finite operations, and creating a buffer when needed. The NI-DAQmx Start Task function explicitly transitions a task to the running state. In the running state, the task performs the specified acquisition or generation. A task will be implicitly transitioned to the running state, or automatically started, if the NI-DAQmx Start Task function is not used, when the NI-DAQmx Read function executes. This implicit transition also occurs if the NI-DAQmx Start Task function is not used and the NI-DAQmx Write function executes with its auto start input specified accordingly. The NI-DAQmx Read function reads samples from the specified acquisition task. The different instances of the function allow for the type of acquisition (analog, digital, or counter), the number of virtual channels, the number of samples, and the data type to be selected. channels, the number of samples, and the data type to be selected. The NI-DAQmx Clear Task function clears the specified task. If the task is currently running, the function first stops thetask and then releases all of its resources. Once a task has been cleared, it cannot be used unless it is recreated. Thus, if a task will be used again, the NI-DAQmx Stop Task function should be used to stop the task, but not clear it. c) Se implementeaza programele descrise mai jos. Objective: To use DAQ Assistant.vi to acquire analog input. 1. On the NI ELVIS protoboard connect the function generator output to channel ACH0+ and the Ground to ACH0-. 2. Switch on the power supply for NI ELVIS station (Switch located on the back of the ELVIS station). 3. Switch on the power supply for prototyping board. Make sure that the three LED’s on the prototyping board are on. manual mode and select sinusoidal function. 5. Open a blank vi and place the DAQ Assistant.VI located on the Function >> Measurement I/O >>DAQmx palette on the block diagram. 6. A DAQ Assist dialog box appears to help you configure the measurement task as shown in the figure below. 7. 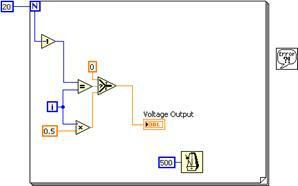 Select acquire signals >> analog input >> Voltage to create new voltage analog input task. 8. The dialog box then displays the list of channels on DAQ device installed. The number of channels listed depends on the number of channels on the DAQ device. Select ai0 and click the finish button. 9. As shown in figure below, a dialog box opens to configure the selected channel. Keep the default settings for the signal input range, timing. 10. To check whether channel is configured properly, click the run button locate on the top left corner of the dialog box. Click OK on the dialog box to return to the block diagram. 11. On the block diagram, right click the data output on the DAQ Assistant and select Create>> Graph Indicator. 12. Create rate and number of samples controls for the DAQ Assistant.vi as shown in the figure below. 13. On the NI ELVIS front panel, in the function generator section, keep the coarse frequency knob at 50Hz and fine frequency and amplitude at the maximum value. 14. Save the VI in your section’s folder as “<lastname>_Analog Input.vi”. 15. Run the VI using rate 1000 Hz and number of samples 50, 100, 200 and 1000. Notice the change in the time scale of the graph indicator when you change the number of samples. 16. Keeping the number of samples at 100, change the rate to 25, 50, 100, 500 and 1000. Notice change in the display of Graph Indicator. Objectives: To analyze the analog input using Statistics .vi and understand the effect of sampling rate. 2. Select the Statistics Express VI from the Express>>SignalAnalysis sub palette of the Functions palette and place it on your Block Diagram. 3. Keep the number of samples at 200 and rate at 1000 Hz. 4. 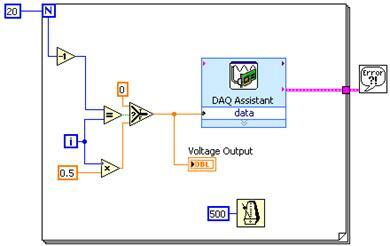 Wire the data Ouput of the DAQ Assist VI to Signal input of Statistics VI. 5. Right-click the Arithmetic Mean output of the Statistics VI and select Create»Numeric Indicator. This will create a numeric indicator on the Front Panel that will display the Arithmetic mean. Repeat this step for the Maximum, Minimum and RMS outputs of the Statistics VI. 6. Right click on the block diagram and select Merge Signals from Express>> Signal Manipulation. 7. Right-click on the block diagram and select Express» Output» Write to Measurement File. 8. Configure the Write to Measurement as shown below. 9. Connect the Mean, Maximum, Minimum and RMS outputs of Statistics Express VI to Merge Signals and Connect the Merge Signal output to Write To Measurement express vi as shown in the figure below. 10. Save the VI in your section’s folder as “<lastname>_SignalAnalysis.vi”. Run the VI by keeping number of samples at 200 and change the rate to 25, 50, 100,250 an 500 Hz. Fix the X-scale of the wave form graph to 0 to 0.2 sec. Discuss the results in your report?. 11. Open the analysisData1.lvm located in ME337L_F08/sec00# and make sure that data for each case is saved in the file. 12. Use excel to plot the data you have collected. Report the data as shown in the figure below. 13. Save the VI and exit. 1. On the NI ELVIS proto board connect the function generator output to channel ACH0+ and the Ground to ACH0- and connect the +5VDC to ACH1+ and the Ground to ACH1-. 2. Open a blank vi. 3. Select DAQmx Create virtual channel.vi located in Functions>> Measurement I/O>> NI-DAQmx palette . 4. Right click on the physical channel terminal and select create from the shortcut menu and select constant. From the drop down menu of the constant, select Dev1/ai0, as shown in the figure below. 5. Right click on the Minimum and Maximum values terminals of the DAQmx Create virtual channel.vi to create controls . 6. Select Timing .vi. located in Functions>> Measurement I/O>> NI-DAQmx palette. This VI specifies the timing of the acquisition. 7. Connect the error out and task out terminals of the Create virtual channel vi to the corresponding terminals of Timing.vi. 8. Create controls in the Rate and Samples per channel terminals of the Timing vi and a constant in its Sample mode terminal. 9. Select Start Task .vi. and DAQmx Read vi located in Functions>> Measurement I/O>> NI-DAQmx palette. Connect the error out and task out terminals of these two vi’s. 10. Select the drop down menu from the DAQmx Read vi and select Analog>>Multiple Channels>>Multiple Samples>>1D Waveform, as shown below. 11. Create an indicator in the Data terminal of the DAQmx Read vi . 13. Add a Simple Error Handler vi located in Functions>>Dialogue and User Interface palette and connect it to the error out of the Clear Task .vi. 14. In the front panel, change the representation of Data from Cluster to Waveform Graph. 15. Save the VI in your section’s folder as “<lastname>_Multiple_Channels.vi”. 16. Set the Sample per channel to 100 and the rate to 1000 and Run the vi and report the results. 17. To sample the input continuously, change the Sample mode of the Timing VI to Continuous Samples. 18. Include the DAQmx Read vi and the Data Waveform in a While loop. Add a control to stop the loop. 19. In the No of samples per channel terminal of the DAQmx Read vi, add a control and set its value to 100. 20. Save the VI in your section’s folder as “<lastname>_Multiple_Channels_Cont.vi”. 21. Run the vi and include the results in your report. In this exercise, the objective is to acquire an analog signal using a DAQ device. Complete the following steps to build a VI that measures the voltage that the temperature sensor on the DAQ Signal Accessory outputs. The temperature sensor outputs a voltage proportional to the temperature. The sensor is hard-wired to channel 0 of the DAQ device. Open a blank VI and build the front panel shown in figure 1. Place the Meter, located on the Controls>>Numeric Indicators palette, on the front panel. Configure the meter scale for 0.0 to 0.4. Use the Labeling tool to double-click 10.0 and type 0.4. 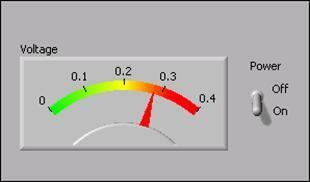 You might need to enlarge the meter to display the scale as shown in the example. Place a Vertical Toggle Switch, located on the Controls>>Buttons & Switches palette, on the front panel. Configure the toggle switch to a default value of False and a mechanical action of Latch When Pressed. Create two free labels, Off and On, using the Labeling tool. Build the block diagram shown in figure 2. Place the DAQ Assistant Express VI located on the Functions>>Input palette, on the block diagram. Configure this VI to read an analog input channel and return the voltage. Select Analog Input>>Voltage for the measurement to make. Select Dev1>>ai0 for the physical channel. The Analog Input Voltage Task dialog box appears. Configure the Task Timing to Acquire 1 Sample. Click the OK button to close the Analog Input Voltage Task Configuration dialog box. This saves the settings specified for the task in the DAQ Assistant Express VI. Place the Wait Until Next ms Multiple function, located on the Functions>>All Functions>>Time & Dialog palette, on the block diagram. Right-click the input and select Create Constant from the shortcut menu. Type 100 in the constant to cause the loop to execute every 100 ms.
Place the Unbundle by Name function, located on the Functions>>All Functions>>Cluster palette, on the block diagram. Use this function to access the status from the error cluster. Place the Or function, located on the Functions>>Arithmetic & Comparison>>Express Boolean palette, on the block diagram. This function stops the loop if an error occurs or the user clicks the power switch on the front panel. Save the VI as Voltmeter.vi in the C:ExercisesLabVIEW Basics I directory. You will use this VI later in the course. Display the front panel and run the VI. The meter displays the voltage the temperature sensor outputs. Place your finger on the temperature sensor and notice that the voltage increases. In this exercise, the objective is to output an analog voltage using a DAQ device. Complete the following steps to finish a VI that outputs voltage from 0 to 9.5 V in 0.5 V steps. Connect Analog Out CH0 to Analog In CH1 on the DAQ Signal Accessory. The front panel is already built. Voltage Output displays the current voltage output. Display and examine the block diagram. The Wait Until Next ms Multiple function located on the Functions>>All Functions>>Time & Dialog palette causes the For Loop to execute every 500 ms. The Select VI located on the Functions>>Arithmetic & Comparison>>Express Comparison palette checks if the loop is in its last iteration. If the loop is in its last iteration, then the DAQ device outputs 0 volts. This is a good technique to reset the output voltage to a known level. It is always a good idea to reset the output voltage to something that will not damage a device that is connected to the DAQ device. Modify the block diagram as shown in figure 3. Place the DAQ Assistant Express VI, located on the Functions>>Output palette, in the For Loop. Complete the following steps to configure this Express VI to generate an analog output voltage. a. Select Analog Output>>Voltage for the measurement to make. b. Select Dev1>>ao0 for the physical channel and click the Finish button. c. In the Analog Output Voltage Task Configuration dialog box that appears, configure the Task Timing to Generate 1 Sample. Change the output range minimum to 0 and maximum to 10.
d. Click the OK button to close the Analog Output Voltage Task Configuration dialog box. This saves the settings specified for the task in the DAQ Assistant Express VI. Close the block diagram but leave the front panel open.